It’s one of the most common reasons many people claim they can’t eat healthy, and a valid one at that: a person can go to the grocery store and load up on foods like one dollar pizzas, loaves of bread, and boxed meals like Hamburger helper and spend a relatively low amount. On the other hand, a person that is trying to stick to a diet of healthy whole foods can spend the same amount and end up with a few fruits and vegetables in their basket – not near enough to make it through a week especially if you’re on a budget. So sure fast food dollar menu could be the fix for the financial end of this problem if you simply can’t afford healthy food, but are there other factors that need to be looked at? Now the most common argument to this situation is that eating unhealthy costs more in the end because of the diseases and complications you will experience in life, which of course is true and one way to to look at the matter, but what about the here and now? Have you dug deeper to explore what goes into the unhealthy food you’re eating and how it may actually be causing you to eat more on a daily basis? This thought process really started after viewing the excellent “Hungry for Change” documentarythat explores the actually “whys” of eating healthier. The documentary emphasizes the ingredients that go into processed and fast food, and how many of them may be making you hungrier more often. Ever heard of Maltodexterine? You may be shocked at how many of the foods you buy contain it, so do your research and you’ll have a better idea of what your putting in your body. That’s not to mention the different modified ingredients or even chemicals that are in foods you eat every day. But what does all this mean? The whole idea here is, yes maybe you’re getting full off the dollar menu at your favorite fast food spot, but have you ever paid attention to how fast you find yourself hungry again afterward? Have you comparied with how long it takes after eating a meal consisting of fruit/vegetables/meats etc. only? 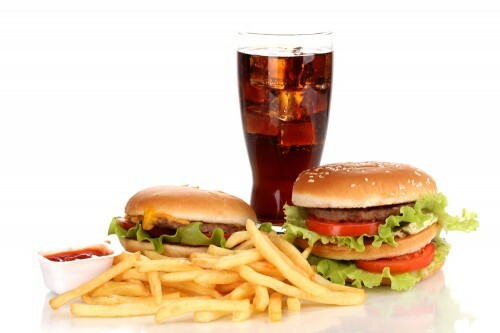 Could some of the fast food giants be using cheap ingredients that make you hungry for more within a couple of hours? It might be time to take a hard look at the crap you’re putting in your body, because if you paid a little more attention you might find that eating healthy might not be as expensive as you once thought. Fill up on whole foods for a week and see what changes as far as how often you find yourself hungry; if you’re not sure what those foods are, we recommend taking a look at the Wheat Belly Diet which completely cuts all questionable ingredients (including wheat, which is another blog for another time) and will give you a chance to see how your body feels without any modified or chemical ingredients. Before long, you might be figuring out that eating healthy is best for you, and your bank account. Difna this looks great!!!!!!!!!!!!!!!!! Can’t say enough how proud I am of you and the changes you are making!!! I know the diet changes are new for you and not always the easiest to make but I love the focus! I also like the way we got a whole lot more Angela this week!! It’s great to get the chance to learn more about you! You look positive and focused and ready for the good results you earned this week. Keep it up!